Beim Voice SDK von OpenSynergy handelt es sich um eine Audioverarbeitungssoftware, die die Sprach- und Audioqualität in Freisprechanwendungen erheblich verbessert. Mit dieser Lösung können Hersteller Sprach- und Audioverarbeitung für Freisprecheinrichtungen und Spracherkennung in ihren Automobil-Cockpit-Geräten implementieren. Zu den Funktionen gehören Rauschunterdrückung, Vollduplex-Echokompensation und ein optionales duales Mikrofon-Array für einen direktionalen Mikrofonieeffekt. Die Voice SDK-Bibliothek verfügt über eine einfache Schnittstelle und lässt sich leicht in jedes beliebige Betriebssystem integrieren. Durch das kombinierte Angebot von Voice SDK und Blue SDK wird ein komplettes Sprachverarbeitungspaket für Infotainment-Geräte bereitgestellt. 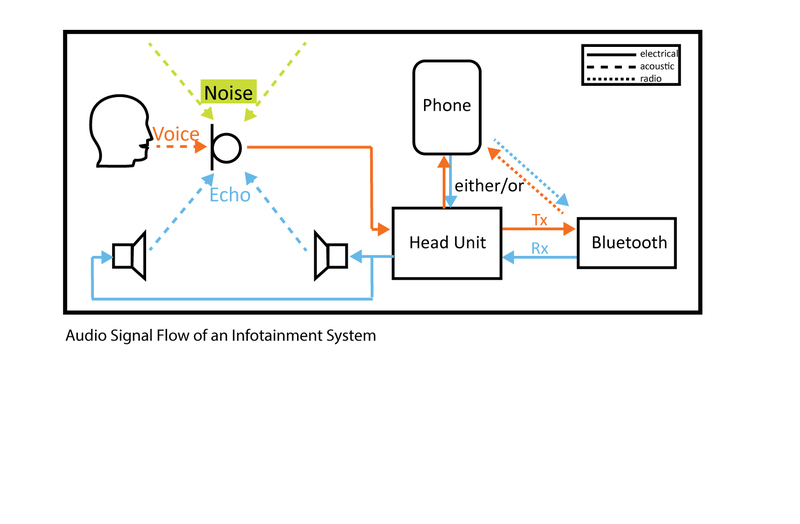 Acoustic Echo Cancelling (AEC) is one of the key components of Voice SDK. It is an extremely robust solution realizing full-duplex communication in a wide variety of use cases. It enables a VDA-compliant hands-free system with an Echo Return Loss Enhancement (ERLE) of at least 45 dB. Fully linear echo cancelling is combined with non-linear processing (residual echo suppression), maintaining full-duplex operation to the greatest possible extent. Noise Reduction (NR) is the second core algorithm of an automotive hands-free SDK. With only one microphone, NR is capable of attenuating stationary or slowly modula- ting noise components up to 20 dB. This is achieved by a proprietary algorithm, which is capable of distinguishing between voice components and slowly modulating noise components, which are typical for automotive hands-free applications. The level of noise attenuation in dB is a tuneable parameter. With two microphones, noise reduction can be further enhanced compared to a single microphone solution. The second microphone provides spatial information about situations of both voice signal and disturbances that come from different directions. As a result also non-stationary disturbances like interfering voices can be efficiently reduced. OpenSynergy offers different variants of array technologies for different microphone spacings and microphone types (conventional cardioid ECMs or modern MEMS microphones). Noise dependent volume control increases loudspeaker output when the environmental noise level grows. A configuration and diagnostic link is very useful as tuning and monitoring interface, in order to check signal qualities in the digital domain, and to set parameter values (e.g. equalizer settings). OpenSynergy suggests a proprietary Bluetooth link to a PC for fast and convenient data exchange with the hands-free system. On the PC, a Graphical User Interface (GUI) is provided that helps to tune the system and – to a certain degree – can even perform an automatic assessment of hands-free operation quality. An array of two microphones enables directional processing, e.g. voice of driver and passenger can be distinguished which is important for voice recognition.